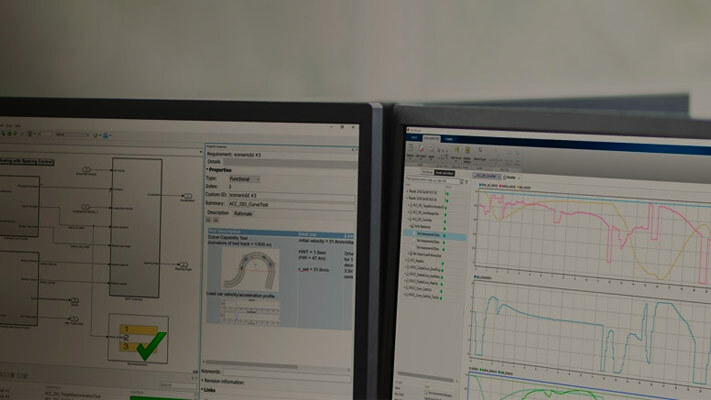 In Simulink, there are various ways to implement Boolean logic, such as through the use of an if statement in a MATLAB Function block, a conditional transition in a Stateflow Chart, or a combination of multiple Logical Operator blocks connected together in a cascade. The example model slvnvdemo_cv_logic_cascade implements the same Boolean expression through the use of MATLAB code in a MATLAB Function block as well as with a cascade of Logical Operator blocks. Open the MATLAB Function block to see the associated function. In the MATLAB Function block, if (a && (b | | c)) is true, then the signal Data1 will be output; otherwise, the signal Data2 is output. Open the subsystem 'Logic Cascade' using the following command and note that this subsystem implements the exact same logic using Logical Operator blocks and a Switch. Finally, open the Signal Builder and note that there are three combinations given for the Boolean inputs a, b, and c. These combinations are FFF, TFT, and TTT. Simulate the model and generate a Coverage Report. In the generated report, navigate to the details for the MATLAB Function block. The MCDC results for the if statement in the MATLAB Function block are as would be expected, given the specified inputs. Next examine the results for the logic cascade. Recall that this combination of blocks implements the same logic as the MATLAB code in the MATLAB Function block; therefore, we would expect that the MCDC results would be the same, as well. Let's first take a look at the upstream Or_Block. Notice that the MCDC summary for this block has a link with the text "see And_Block", referring to the Logical Operator at the root of the cascade. Click on this link to be taken to the section of the report showing results for this block. The Logical Operator block at the root of the cascade (in this case And_Block) reports the MCDC results for the entire cascade. The details for the MCDC analysis of the cascade first show a link illustrating how many blocks are included in the cascade. Clicking on the link "Includes 2 blocks" will bring up the model and highlight the two blocks included in the cascade (Or_Block and And_Block). This section of the report then shows the Boolean expression represented by the cascade, in this case C1 && (C2 | | C3), where C1, C2, and C3 are the conditions which correspond to the three inputs to the cascade. For each condition, the table illustrates the associated block and its input (shown in parenthesis) as well as the MCDC result. These results indicate that the input combinations TTx, Fxx, and TFT have all been exercised, but TFF has not. This matches the expectation given the inputs generated by the Signal Builder (TTT, FFF, and TFT). Furthermore, as expected, both the Boolean expression and MCDC results shown for this cascade match what was shown for the if statement implementing the equivalent logic in the MATLAB Function block. As was shown in the Coverage Report, MCDC objectives are not recorded for the individual Logical Operator blocks in a cascade; rather, MCDC objectives are recorded for the Boolean expression represented by the combination of blocks in the cascade, and results are reported on the final block in the cascade. The highlighting of the model reflects this, as well. Given the input combinations FFF, TFT, and TTT for the three inputs a, b, and c, Or_Block receives full coverage, because all of the block's Condition coverage objectives have been satisfied. However, because there are MCDC objectives associated with this cascade which have not been satisfied, And_block (the final block in the cascade) is highlighted in red. Hover over And_block for more information. The tooltip correctly reports that this block does not receive full coverage, because some MCDC objectives for the cascade are not satisfied. You can also retrieve the MCDC results for the logic block cascade from the MATLAB command line using mcdcinfo. Again, MCDC objectives for the cascade will be found on the final block in the cascade. Other blocks that are members of the cascade will not exhibit MCDC objectives. In example model slvnvdemo_cv_logic_cascade, coverage settings are set such that Logical Operator blocks are treated as short-circuiting. Due to this setting, when analyzing a cascade of Logical Operator blocks, the operators in the corresponding Boolean expression are treated as short-circuiting for the purposes of MCDC. As illustrated by the results shown above, this means that MCDC recognizes short-circuiting that occurs both within and across Logical Operator blocks. As such, the MCDC results for the cascade of Logical Operator blocks matches those of the if statement in the MATLAB Function block, as the latter is always treated as short-circuiting. Notice that in the example above, the True Out MCDC objective outcome for C2 is TTx, indicating that when C1 and C2 are both true, C3 is inconsequential due to short-circuiting within the Or_Block. Furthermore, consider the False Out MCDC objective outcome for C1, Fxx. This outcome illustrates how MCDC analysis recognizes short-circuiting across blocks. Because the first input to And_Block is false, the second input is short-circuited. Subsequently, for the purposes of MCDC, this short-circuits Or_Block (and both of its inputs) entirely. The short-circuiting behavior of MCDC for logic block cascades occurs based on the precedence of operations in the corresponding Boolean expression (regardless of the execution order of the Logical Operator blocks during simulation). You can also treat the Boolean expression represented by a cascade of Logical Operator blocks as non-short-circuiting during MCDC analysis, provided that the masking definition of MCDC is being used. To do so, set the parameter CovLogicBlockShortCircuit to "off" and ensure that CovMcdcMode is set to "Masking". These are, in fact, the default settings for these parameters when creating a new model. Note, if CovLogicBlockShortCircuit is "off" and CovMcdcMode is set to "UniqueCause" then the Logical Operator blocks in a cascade will be analyzed individually for the purposes of MCDC, and MCDC for the Boolean expression represented by the cascade as a whole will not be calculated. Notice that when the cascade in this example is not treated as short-circuiting, some MCDC objectives are no longer satisfied by the given inputs.